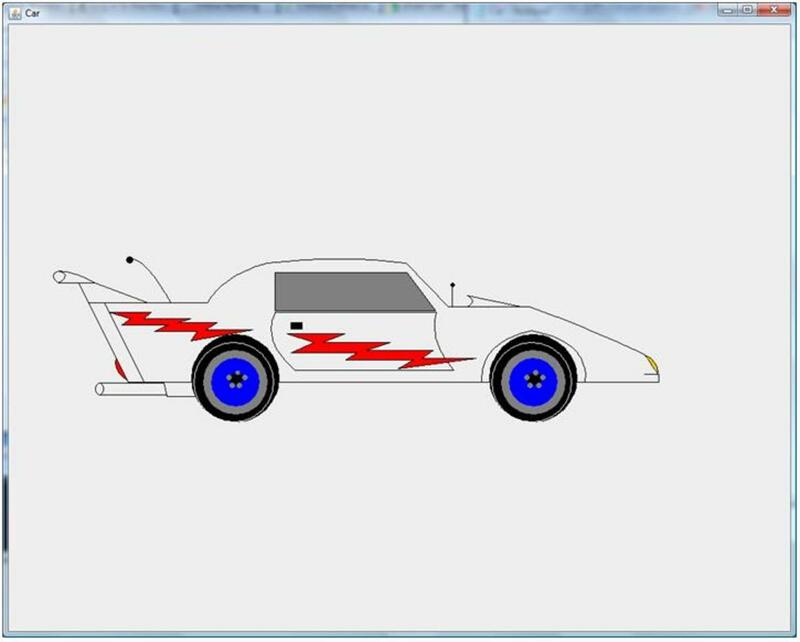 Our first assignment was to design a Car using Java 2D...and this is what I designed. I know the drawing is a little crude. For those of you that are tired of text based/console programming and want to add original two dimensional drawings to your Java code, than Java 2D is for you!!! If you have not read my profile, I was awarded my A.S. in Computer Science in May 2012. I was fortunate that in my last semester of school, I was able to learn Java 2D (it was the first time that class was offered). 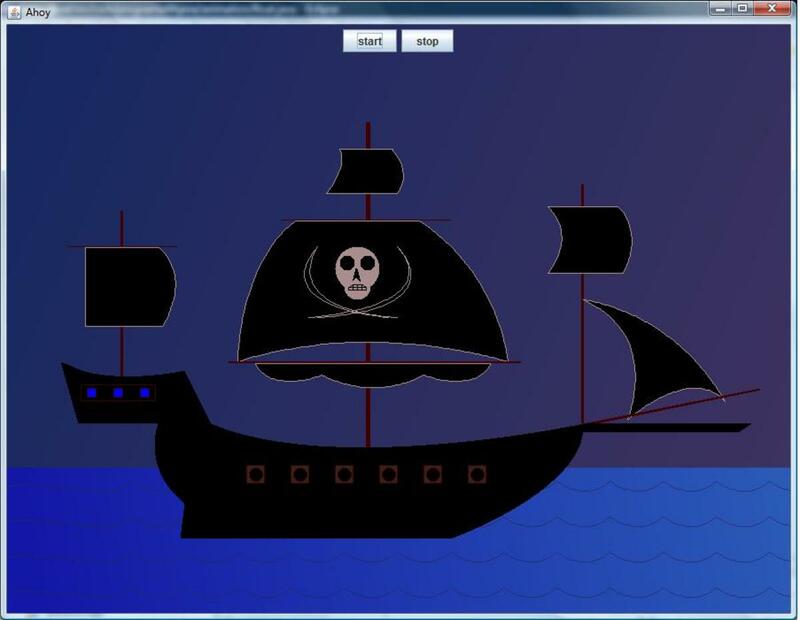 The picture of the Car to the right and the Pirate Boat below this section are screenshots of my own original designs that the instructor assigned. 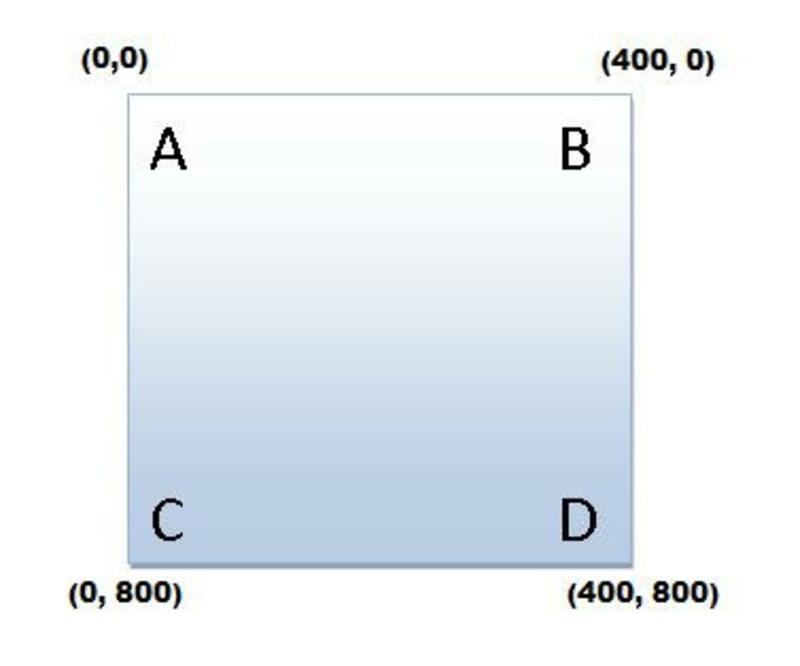 In this tutorial, I will give you the very basics of starting in Java 2D. 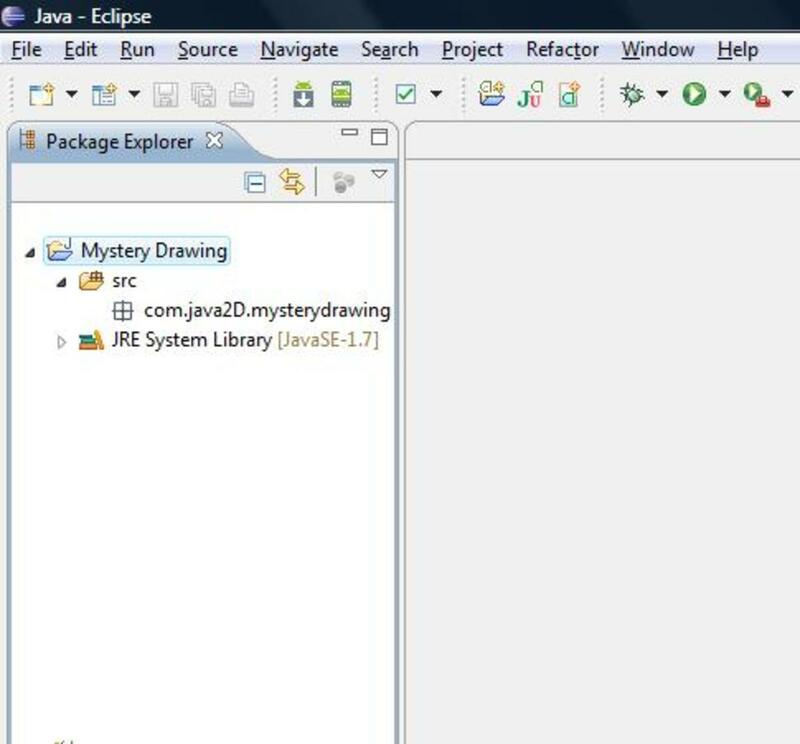 Using Eclipse, I will cover how to create a Package, I will give a brief explanation of Classes, how to create a Java Abstract Class, and a Java Class that Extends the Abstract Class. 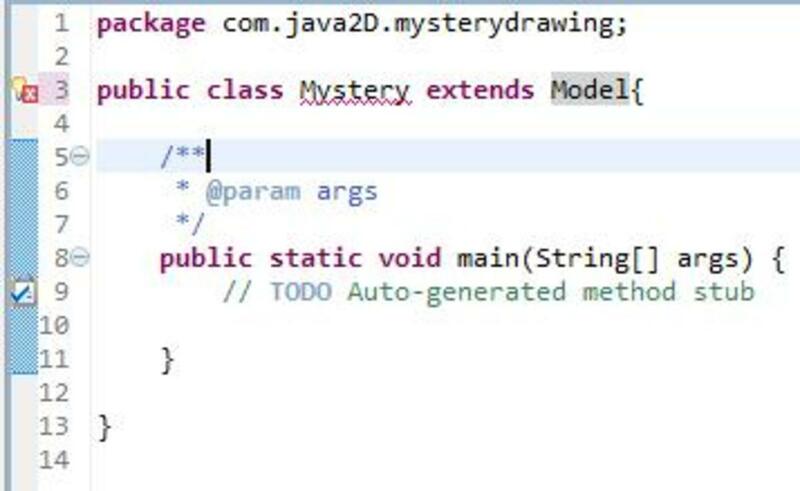 By the time you have finished the tutorials, you will reveal the Mystery Drawing and hopefully have a good grasp of starting Java 2D. This tutorial is meant for those that are already familiar with Java and/or other OOP (Object Orientated Programming) languages. Although this tutorial is not meant to serve as an Introduction to Programming for those not familiar with OOP, I will do my best to explain each step. Once you have installed the JDK and Eclipse, now you are ready to begin. 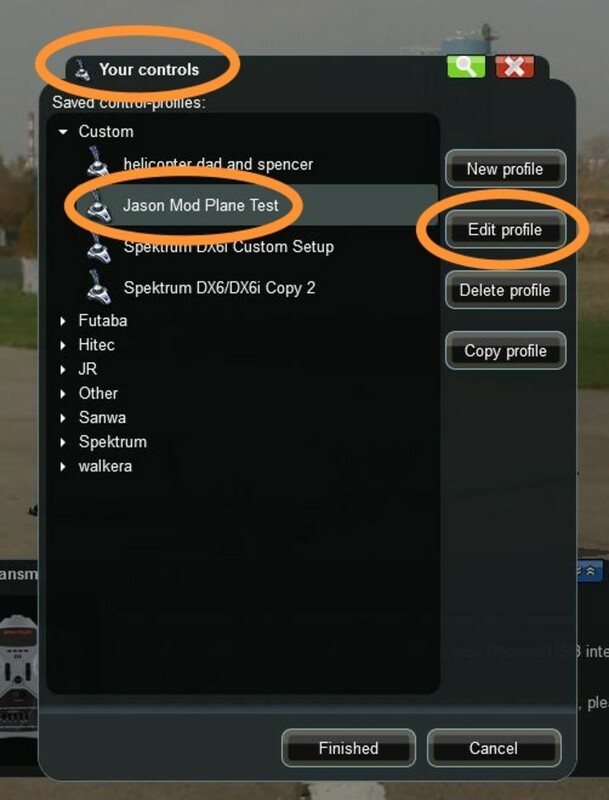 *Note when you start Eclipse you will see a pop up asking you to Select a workspace, you can either accept the default location or choose a location of your choice. 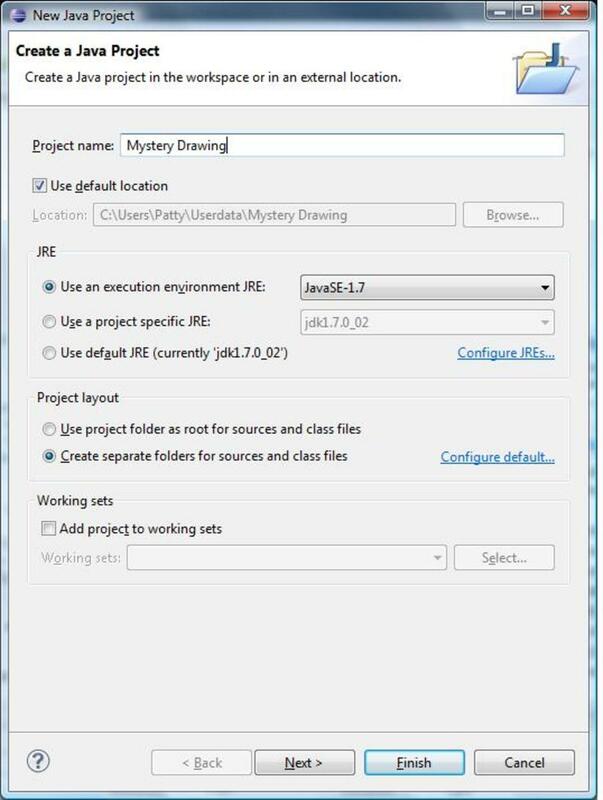 Create a New Java Project window will appear. 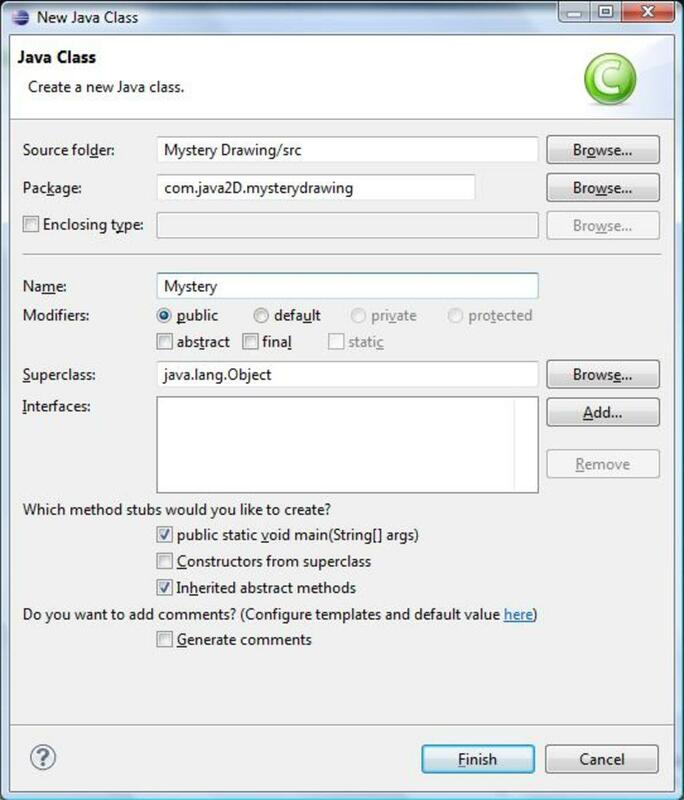 In the Project Name text box, type Mystery Drawing and then click Finish. Again this is not an Intro To Programming Tutorial, however, for those that don't know, a Class can be described as the building blocks/blueprints that individual objects are created from. Very Basic Example: Let's say you were building a house. What does a house have? With this information we have the building blocks/blueprints of creating a house. If you are new to programming in Java, you may want to read about Inheritance, Interfaces, and Abstract Methods. For those that are familiar with C++, Java does not have multiple inheritance. Now we are going to Create our first Class. Type the code listed below. You should type the code instead of copying and pasting...this will help you become comfortable with the language. The // are used to write one line of comments to explain the code. /* */ are used to write more than one line of comments. All comments are placed above the code so that you know what you are looking at. 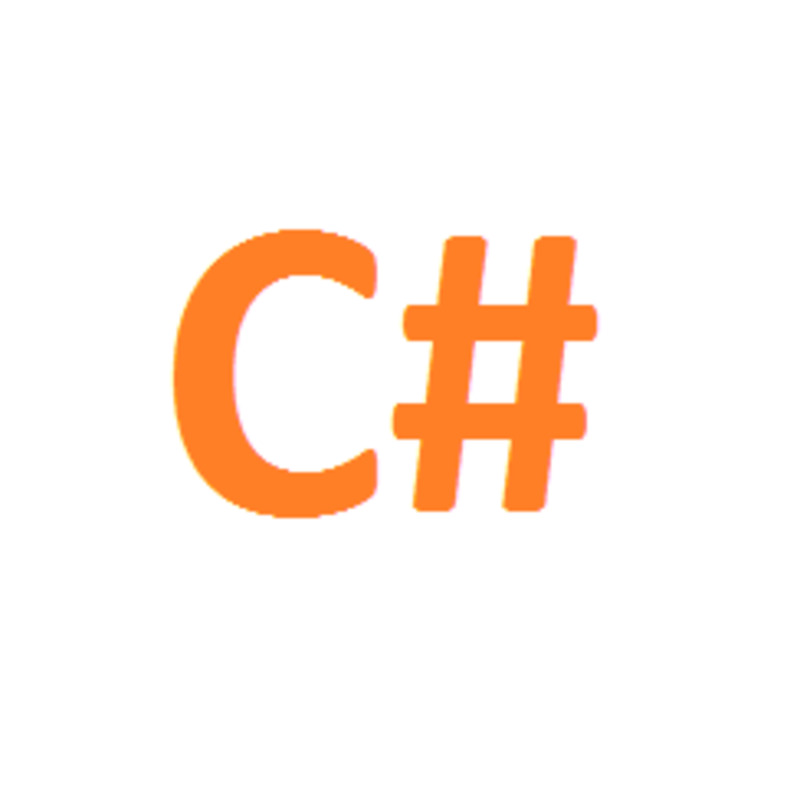 If you are familiar with C++, import it is the equivalent to C++ #include. *Note in the Model Class code posted below for some reason the below constructor shows up in green like the comments do. This should NOT be commented out. Now we are going to Create our first Class that will extend the Model class. *Note it make take a few moments to build. When you do this, you will notice the word Mystery has a red squiggly line, hover your mouse over the word Mystery you should receive a pop up, click Add unimplemented methods. Notice you now have the drawShape method created in the abstract class Model. *Note that the word method (used in Java) is the same as function in other languages. Rearrange your code so that it looks the same as the code posted below. All I really did was move the drawShape method above the public static main void. In the next tutorial, I will cover JFrame, JPanel, Coordinate system, Custom Colors, Gradient Paint and Testing your code. I hope you find my tutorials informative and I hope they give you a better understanding of the subjects covered. If you do like my tutorials you might want to check out my other Hubs and perhaps learn something new. THANK-YOU for taking the time to read this. GOOD LUCK!!!! am not getting how to run thisZ???????????????? Leo, Thank-you!! I will be doing more tutorials soon! Thanks Again!! Muito bom! Obrigado pelo tutorial!